Lhasa temperature The last two days, Lhasa people had suffered a sudden cooling. Because the Lhasa temperature dropped to-6 ℃. News from the Tibet Meteorology Bureau, affected by the cold air, the temperature of whole Tibet from west to east had occurred a significant cooling from Dec.2nd. Furthermore, in Qamdo, Shannan, Nyingchi area, the cooling rate could reach to 8 degree to 10 degree. In Lhasa, Nagchu, Shigatse and other places, the temperature could reduce 4 to 6 degree. 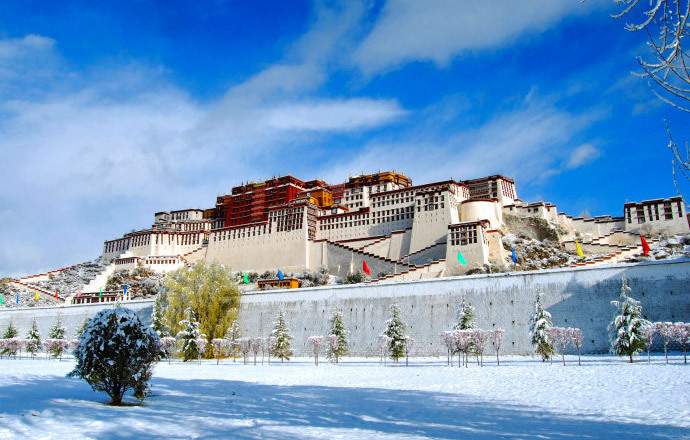 The data showed that on Dec. 3rd, the maximum Lhasa temperature has dropped to -10 ℃, and the lowest temperature has dropped to -6 ℃. Sweet Tips The Meteorology Bureau reminded the citizens to keep warm in case of getting cold. Meanwhile, the bureau also warned that the sudden cooling weather may damage urban pipelines and other municipal facilities. So some relevant departments should get ready of anti-freeze measurement. Affected by the cold weather, the recent air humidity is too small, people tend to have uncomfortable feelings. And some people may get their lips chapped, nose bleeding and throat itching and other phenomena. If you have any of the phenomena, you should drink more water than usual. Above all, the weather is changing greatly between day and night, so you’d better be prepare of the extreme weather in Lhasa. (If you are fond of my posts, please follow our website here Bella Chang, I’ll update every day.) To learn more Tibet travel related information, please contact local Tibet travel agency (www.tibettravelexpert.com).